The waters surrounding San Juan Island are indeed one of the best spots in the country to see whales in the wild—especially orcas. 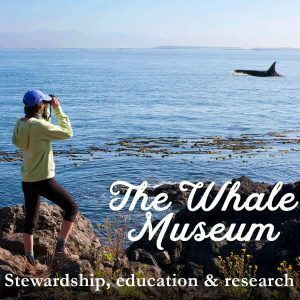 Out of pure marine wildlife-loving curiosity, two summers ago I completed the Marine Naturalist Training Program through the Whale Museum and have been hot on the whale trail ever since. The second I set foot on Washington State Ferries in Anacortes for the one-hour crossing to Friday Harbor, I took out my binoculars to scan the Rosario Strait for Steller sea lions, harbor seals, harbor porpoises, humpbacks, minkes and orcas. 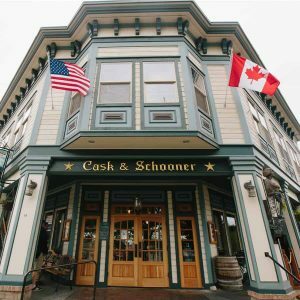 Here’s how to make the most of whale watching on San Juan Island in forty-eight hours. You might see a whale if you stay with us! 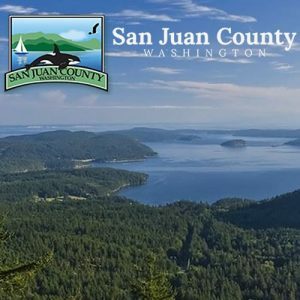 If you want to watch whales from shore, head up the west side of San Juan Island to Lime Kiln Point State Park. Pull out at the Westside Scenic Preserve for photo-ready 180-degree views of Haro Strait, and beyond, the Olympic Mountains. 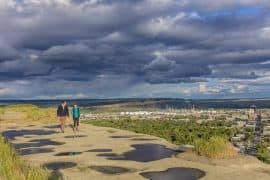 Whales and marine life are frequently spotted from the half-mile stretch of rocky bluffs, greeting visitors who traverse the roughly fifteen-minute ride across the island from the ferry to the coast. Continue to wind along Westside Road another 3 miles until you reach Lime Kiln Point State Park, aka Whale Watch Park. Your best bet for seeing whales is to hunker down at one of the picnic tables along the short coastal hiking trail or near the century-old lighthouse. 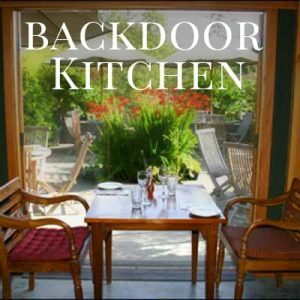 It’s easy to while away a few hours over a book, packed lunch or board games. (I’ve logged many hours at this park and have been rewarded with marine life sightings, including the second confirmed sighting of a fin whale since 1930 last summer.) As you sit among the rust-colored Pacific Madrones, listen to the nearby Lime Kiln Hydrophone, which signals the presence of the Southern Resident Killer Whales. This extended family consists of three pods: J, K and L. The fragile population of eighty-two orcas is protected by the Endangered Species Act, and it feels like a privilege to be in their presence. Venture into the 1919 lighthouse and spend some time talking with volunteer Jeanne Hyde. 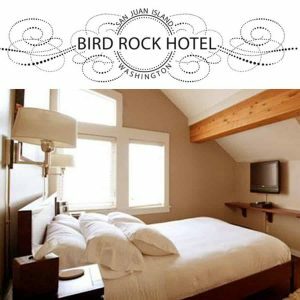 Tours are available during the summer months. 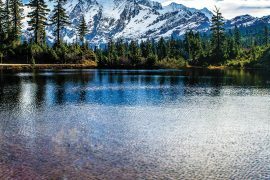 Hyde was a naturalist with Maya’s Legacy and has encyclopedic knowledge of the Southern Resident Killer Whales and the fragile surrounding marine ecosystem. 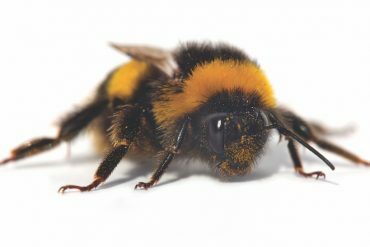 In a recent conversation, she talked about the key role wild salmon habitats play in the survival of our beloved local population and the differences between the Southern Resident Killer Whales and Transients, or Bigg’s Killer Whales. The former are pescatarians with a fancy for Chinook salmon, while the latter are marine mammal hunters named for Michael Bigg, a Canadian marine biologist who first developed photo-identification techniques via dorsal fin markings. When I mentioned the sighting of a humpback the previous evening, Hyde played an audio file of another male humpback, the first one recorded singing in Haro Strait. She admitted she slept alongside the hydrophone so as to not miss any sounds throughout the night. The best time to see whales in nearby waters is from May to September. 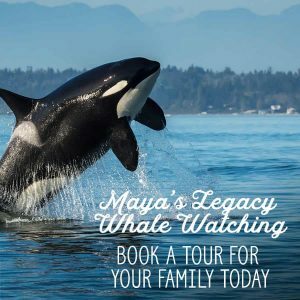 During my annual one-week vacation on San Juan Island, my orca-obsessed crew spends two days on the water with Maya’s Legacy Whale Watching. 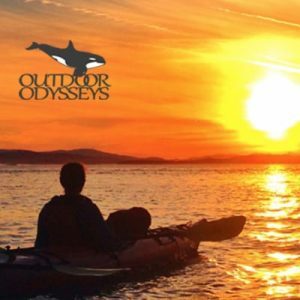 I’ve gone out whale watching with many outfitters on San Juan Island, and these folks are my favorite. Launching from Snug Harbor, the small boats accommodate just six passengers. Maya’s Legacy has a brand new, slightly larger vessel that leaves from Friday Harbor, which is convenient for travelers without wheels. Compared to other whale-watching boats, it’s a far more intimate, interactive experience. Often there’s group input on whether to stay with a group of whales or move on to the next marine wildlife adventure. On a recent outing, Captain Alan Niles and our naturalist, Rachael Mueller, a Ph.D. in physical oceanography, led us north out Haro Strait through Boundary Pass. We slipped between the Gulf Islands National Park Preserve, through Boat Pass into the Strait of Georgia and headed for the mouth of the Fraser River, where we’d been tipped off to Southern Resident Killer Whale sightings. 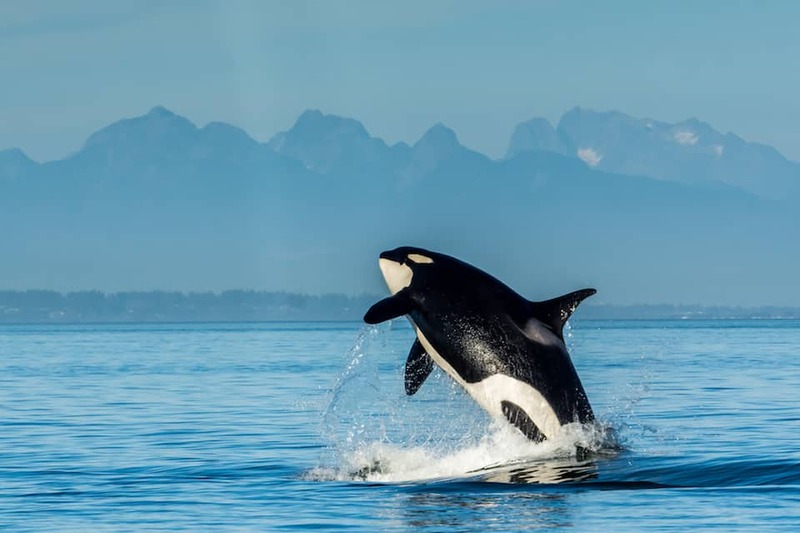 Notably, 80 to 90 percent of the Chinook salmon the Southern Resident Killer Whales consume in inland waters come from the Fraser River and its tributaries. There we found the J pod spread across a vast area, their mighty dorsal fins and polished black marble backs surfacing to share their location. Some orcas, including Oreo, mother to Cookie, were surfing the rolling waves of an oil tanker passing by, creating splash after splash. Others were swimming in small groups, exhibiting playful behavior, such as tail-slapping, pec-slapping, spy-hopping and breaching. The photo-ops were endless. At one point, we saw a mother roll on her back and raise a paddle-shaped pec fin to nurse her calf. Then, curiosity got the best of one orca, who swam up alongside our boat. With majestic snow-capped Mount Baker looming in the background and a full moon rising, the J pod looked spectacular. If you haven’t spent time with orcas in the wild, there’s nothing like it. Audible blows or the sound of an 8,000-pound male hitting the water is amazing. If you’re short on time, you can always take the forty-five minute Kenmore Air sea plane from Seattle’s Lake Union to Friday Harbor to go whale watching with San Juan Safaris. 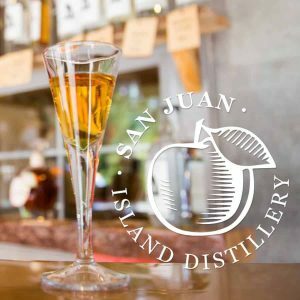 The three-hour tour is available from April through October. 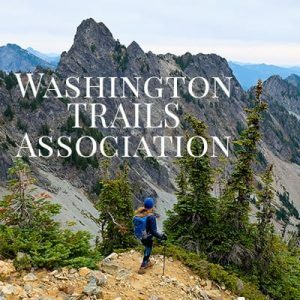 As the nation's largest state-based hiking nonprofit organization, Washington Trails Association is the voice for hikers in Washington state. We protect hiking trails and wildlands, take volunteers out to maintain trails, and promote hiking as a healthy, fun way to explore the outdoors. 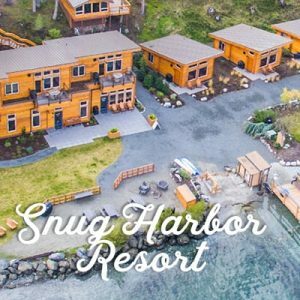 Welcome to the all new Snug Harbor Resort Located on San Juan Island’s west side, on peaceful Mitchell Bay, Snug Harbor Resort offers year-round waterfront accommodations. 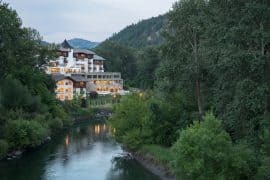 All of our 17 cabins and three suites are spacious with beautiful interiors, expansive glass, vaulted ceilings, full kitchens, and uninterrupted, stunning views.